Sorry I’ve been so silent here. Usually no news is good news, though! I started my course of Yervoy/ipilumumab about a week and a half ago now. This will be 4 injections spaced 3 weeks apart, so I should be done by Christmas-ish, I think. The side effects are supposed to range from likely/probable fatigue, skin rash and GI issues (all relatively minor or easily dealt with), with the possibility of serious side effects requiring hospitalization. I’m hoping I’m not one of those lucky few! So far, it’s honestly been pretty good. I got pretty decently fatigued for one day, with minor fatigue for a few days leading up to that. But then the day after my tiredest day, I felt 100% better, so that was great. Now it seems like I’m getting a few tiny random itchy red bumps, but they are so random and distinct that they seem less like a rash/skin irritation and more like I was attacked by a few tiny, rogue biting insects. They say that the side effects tend to really show up after the second infusion, so we’ll see how I’m doing in a few weeks. Kaiser is covering this round (the only thing I can really do at this point, so the only thing they will cover). Thank GOODNESS, too, because retail for this bad boy is $100k-$200k, per injection. That means it could run me up to $800,000 freaking dollars if I had to pay out of pocket. And I might end up needing more treatment anyway! Craziness. I’m running around with the equivalent of a pretty decent house in much of the country running through my veins. I have to make the most of it! Other than that, I feel like Peter and I are really getting back in the groove. He has been feeling a lot better, overall, and so has been able to take back some of the family/childcare/house duties that either I had been doing or that had just fallen by the wayside. Emmie is just her funny, crazy, creative, always-surprising self. The other morning, we had a beautiful sunrise and she said, “Mama look! The sky is pink and blue and orange! It’s a rainbow sky with all the colors!” She’s constantly amazing us with her creativity, perceptiveness and inventiveness. She is obsessed with art these days. She loves getting cardboard boxes and making things out of them. The latest was a rocket ship she spent hours lovingly coloring and painting. When we got a smaller box, roughly head-sized, she took one look and said, “That’s my rocket ship helmet! I need to cut out the hole for my eyes” and then proceeded to describe exactly what she would been to do to make it a helmet (and she was right!). We just spent part of the weekend shopping for and assembling a little art station for her because Peter and I were sick of stepping on tiny scraps of paper everywhere, stumbling on markers, and slipping on crayons at every turn, all of which were extremely precious and could not be moved because she was not done with her “book.” So now it is all corralled into some lovely IKEA organizers and we are sternly warning her that anything not put away will be thrown out (I have no compunction about tossing bits of paper, however deeply she may feel about them). She also continues her pattern of “stair step learning.” When she was a baby, she would wait until I was about to call the pediatrician about some milestone, and then she would wake up the next day with it practically mastered, out of nowhere (apparently I was rather similar as a baby). Maybe a month and a half ago, I was vaguely concerned about her writing grip and her apparently complete lack of interest in coloring, drawing or anything like that (all red flags in my world of development). About a month ago, she was drawing on her easel and narrating her art when I became aware that she was saying something about writing a letter of her name (I admit, I often do the half-listening thing when she is play-talking, especially if I’m trying to cook or something). So I turn to see what she considers an “M” and sure enough! it was *definitely* an M! She then followed it up with another M, then an E, then realized she needed another E at the beginning. After she finished it, she said “I forgot the I,” so she knows how to spell her name too! Even more astounding to me was last week when I could hear Peter and Emmie playing while I cooked. 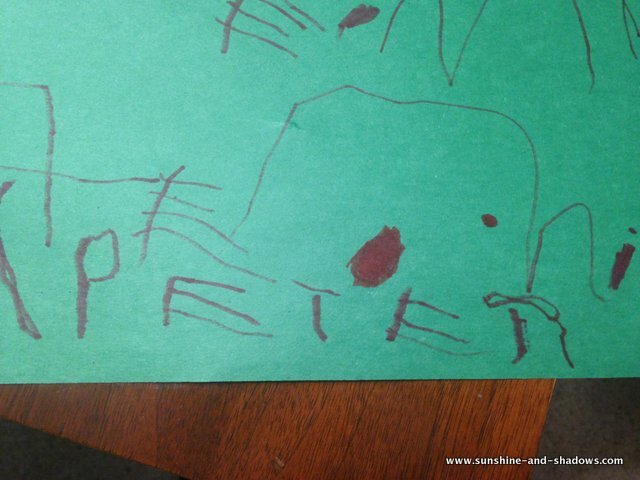 I could hear that she wanted to write someone’s else’s name, and she and Peter were trying to decide whose to write. They settled on Daddy’s name and then I heard Peter verbally describing how to make a P, E, T, E, and R (with apparently no visuals). I was terribly curious as to how this experiment could turn out. I was shocked at what I saw (and unlike Upworthy, I will show you immediately without making you watch some video. Spoiler: it was pretty good). I’m honestly not sure that I could make a legible P with the instructions to make a line down and then make kind of a circle at the top. Right? And in true Emmie fashion, contrary to the end, she has steadfastly refused to write any more letters, including her own name, with the exception of a decent M and a really good G (copying a sample I made for her) for cards for friends. 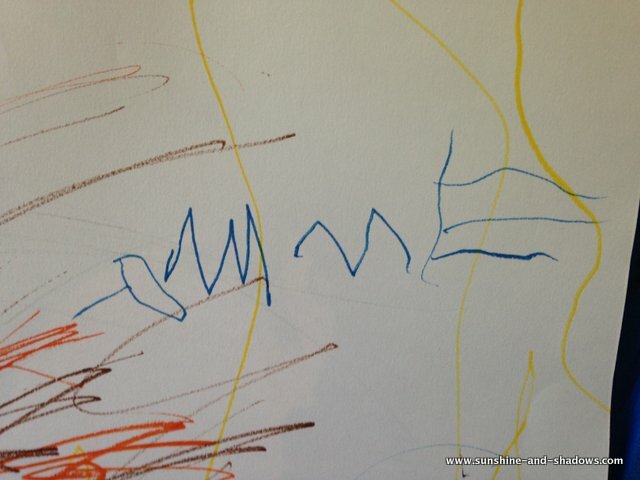 I swear I will be sweating it out as she enters kindergarten that she’s forgotten how to write her name, and she’ll start writing full sentences the next day. (I’m convinced she will turn to us one day and be able to read full books without us ever teaching her. She resists any and all attempts to learn to read, so we are not pushing it at all. Since she is only flipping three! Accelerated learning, reading in kindergarten be damned! ).